Just arrived this week is the stunning new limited edition Minichamps Brawn GP car driven to victory in the 2009 F1 seasons opening race. This model is a limited edition of only 8,208 and features a Jenson Button figure standing in the car with his arms raised in the air. Be sure to get this one quick before stocks run out as this model is now sold out at suppliers. 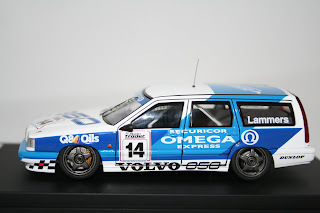 New in stock this week are the stunning 1:43 HPI Volvo Estate cars as raced in the 1994 BTCC Championship by R Rydell and J Lammers. Both models have great detail inside and outside the car, come on a black display stand with a limited edition plaque, have a hard perspex cover and an outer card sleeve. Please visit our shop below for full details before they sell out. Hart Motorsport are please to announce the arrival of a collection of Jordan F1 models. We have a limited number of the following models, some which are now very rare. For prices and pictures please visit our shop below. Just arrived this week is the latest Ayrton Senna Collection model. This stunning Lotus 99T by Minichamps is number 31 in the collection. 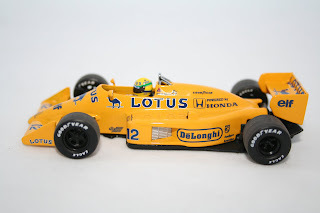 The model celebrates 15 years of the Ayrton Senna Institute and is of the usual high quality you would expect from Minichamps. Like the Brawn model also released this week we have sold over 50% of the models on pre orders alone and this model is now sold out at suppliers. Limited to just 6,624 pieces World Wide we suggest you hurry to grab a bargin as these models will only increase in value over the years. Please visit our shop below before they are all sold out! New in stock this week is the stunning 1:43 Minichamps Brawn GP 001 F1 Car driven by Jenson Button to this years Formula One World Title. This model has been one of our fastest selling F1 cars ever and we have nearly sold out on pre orders alone. Also new this week are the F1 McLaren, Force India and Toro Rosso Showcars which are the last of the 2009 Grid to be released. For costs of these models plus information on hundreds more models please visit our shop below.